Oconee County Commissioner Chuck Horton has asked County Administrative Officer Jeff Benko to add legislative redistricting to the agenda for the Board of Commissioners meetings scheduled for Nov. 27 and Dec. 4. Horton told me in email messages from Sunday and again today that he will ask the BOC to endorse an effort to restore Oconee County to a single district in the Georgia House of Representatives. Horton made a similar statement on Nov. 14 when he, other commissioners, members of the Board of Education, and city officials in the county met with the county’s current legislative delegation in a session at Veterans Park. Regina Quick, elected on Nov. 6 to represent the new 117th House District, said at that meeting she will seek to change her district if she is given the support of the county citizenry and leadership in that effort. The 117th House District includes the Oconee County precincts of Bogart, Malcom Bridge and Athens Academy as well as parts of Barrow, Jackson and Clarke counties. The remaining 10 Oconee County precincts are in the 119th House District. Chuck Williams, currently representing the 113th House District, was elected on Nov. 6 to represent the newly created 119th House District. 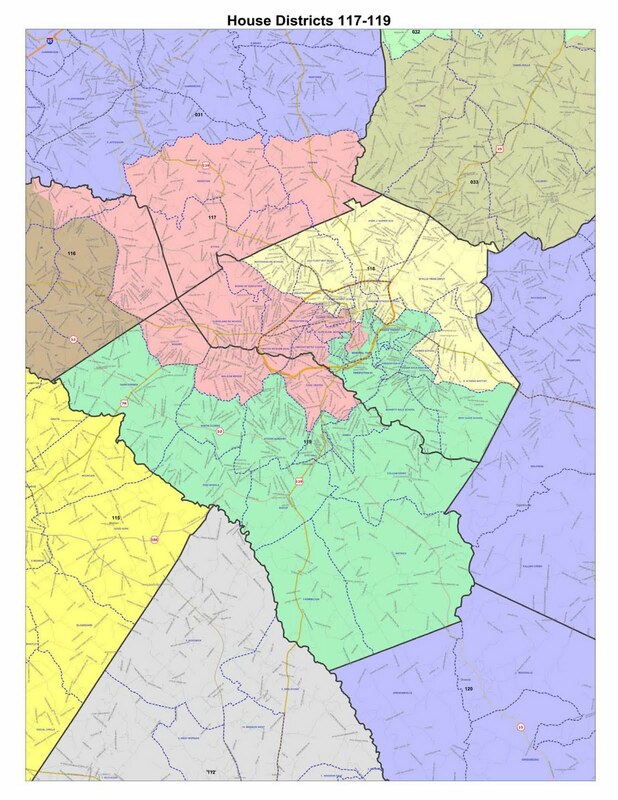 Oconee County, which had been in a single House District since 2004, was split into two districts in the redistricting session of the Georgia General Assembly in August of 2011 to create a district with a Republican voting history, based on past elections. The Republicans controlled both houses of the General Assembly. The district was created to include the Clarke County neighborhood in which Doug McKillip resided. McKillip had been elected as a Democrat from the old 115th House District but had changed to the Republican Party after his election in 2010. Commissioner Jim Luke also spoke out at the meeting on Nov. 14 in favor of Quick’s proposal to revisit redistricting with the purpose of uniting all of the precincts in Oconee County. Though Commissioner John Daniell also attended, he did not speak up on the issue. Commissioner Margaret Hale did not attend the meeting. BOC Chairman Melvin Davis, who opposed the split in the county before the district plans were announced, did not commit himself at the Nov. 14 meeting. Davis would vote only in the case of a tie among the other four commissioners. Williams asked those present to decide if they were opposed to redistricting because of a “bad taste” left by the redistricting process or because they didn’t want the county to have two representatives in the House. He said there were advantages to having both Quick and himself represent the county. Williams also said he didn’t think there would be much interest in the House in revisiting the redistricting issue. Sen. Bill Cowsert said the Senate would “rubber stamp” whatever the House sent to it. He said he didn’t think there was any interest in the Senate in revisiting redistricting. All of Oconee County falls in the 46th Senate District, which Cowsert represents. Oconee County was the dominant county in the old 113th, but it makes up less than half of Williams’ new 119th district and about 20 percent of Quick’s new 117th House District. Clarke County makes up the majority of both districts in terms of population. Cowsert, Quick and Williams are all Republicans, which will control both houses of the newly elected General Assembly. The Nov. 27 BOC session would allow the commissioners to discuss the redistricting issue before taking a final vote on Dec. 4. The discussion of redistricting dominated the session on Nov. 14. Williams and Quick made it the key part of their introductory comments. The session was chaired by Davis. The video below contains the introductory comments on redistricting as well as others throughout the meeting dealing with the topic. I could not attend the session on Nov. 14. Russ Page and Sarah Bell recorded it for me. The full video is now live on the Oconee County Observations Vimeo site.